Researches say there are basically 7 main emotions that people experience such as Joy, Sadness, Fear, Anger, Disgust, Contempt and Surprise. Some says, it can be categorized into SAD, MAD, SCARED and GLAD. It is impossible to be spiritually and mentally healthy without being emotionally healthy. Emotional, spiritual and mental health are inseparable. Your personal success depends on the strength of your mind and your emotions. What are the different things that mentally or emotionally strong people do? There are many things they do different in comparison with mentally and emotionally weak people. First of all, they move on in life, they never get stagnated. This is same with the water. The stagnated water gets polluted. There are many reason to stay and enjoy life, but remember to live your life forward, not backward. In life there are better people, better places, better relationship, better encounters but staying back in the same place is not what strong people do. They keep control of the situations, they embrace change, they stay happy, they are kind and compassionate, they are willing to take calculated risks, they invest their energy in the present, they accept full responsibility for their past behavior, they celebrate other people’s success, they are willing to fail or they will be friend with failure as much as they love success, they enjoy their time alone, they are prepared to work and succeed on their own merits, they have staying power or they will not blame others instead of taking responsibilities, they evaluate their core beliefs, they expand their mental and emotional energy wisely, they are problem solvers and not problem creators, they can survive in life with out depending on others recognition and they always think productively. The backbone of any healthy organization is based on the mentally and emotionally healthy people in the organization, which includes the church, politics, social or innovative enterprises. The core of christian life is based on the relationship with God and relationship with people around. People who are emotionally and mentally healthy are in control of their behavior. They are able to handle life's challenges, build strong relationships, and recover from setbacks. There is also intrinsic connection between physical health and emotional health. 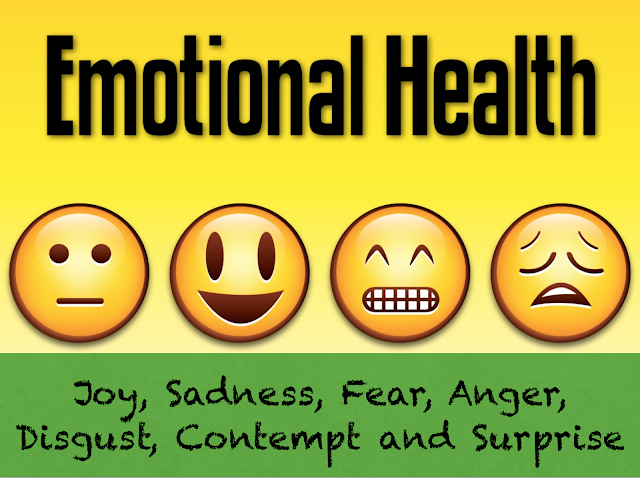 Emotional health also help you to be self-confident, self-aware, be happy and has great energy of optimism. Stress is one of the major enemy of emotional health. Stress produces stress hormones, which wear down your body, create anxiety, irritability, guilt and depression. Keeping those bad energies like anger, sadness, guilt and lose within you will steal all your good energies, productivity and create apathy. Feeling of rejection, loneliness, anxiety, lack of coping skills, feeling of hopelessness, sadness and dependency on chemical substances are signs of lack of emotional and mental health. Evaluate your relationship and friendship and create supportive positive relationship around you. Exercise will create brain chemicals like serotonin, dopamine and norepinephrine which will help you to deal with some effects of stress. Depression, lack of motivation, anxiety, stress, poor body image, unresolved grief and lack of self-confident are symptoms of poor emotional health. There is an old christian song and its lyrics say, Count your blessings one by one… Look for positive side of your life, that will bring happiness, hope and joy. Remember this, no one can make you emotionally unhealthy with out your consent. Find out the triggers that leads to lack of emotional health. Work on your self-image or your self-perception. Remember to feel OK because you are unique. STOP trying to be someone or somebody. Some times you need to stop listening to others who are not helping your emotional or mental health. Seek counseling and professional help and remember it is a sign of not weakness but strength. Bible is full of suggestions and surprises for your emotional and mental health. Philip: 4: 6-7 says: Do not be anxious about anything, but in everything by prayer and supplication with thanksgiving let your requests be made known to God. And the peace of God, which surpasses all understanding, will guard your hearts and your minds in Christ Jesus. The eschatological teachings in the Bible is also connected with your ultimate healing and wholeness. I Peter:5:10 says: And after you have suffered a little while, the God of all grace, who has called you to his eternal glory in Christ, will himself restore, confirm, strengthen, and establish you.